The activity of liver microsomal detoxication enzymes has been investigated in tumor-bearing rats exposed to preliminary irradiation. Preliminary irradiation of rats (before transplantation of Guerin’s carcinoma) resulted in the decrease of liver microsomal cytochrome ê450 and glutathione-S-transferase observed in the latent and logarithmic phases of oncogenesis as compared with the non-irradiated tumor-bearing rats. The decrease in cytochrome P450 activity may be associated with its transition into an inactive form, cytochrome P420. During subsequent steady state period the tumor development is the factor determining changes of the studied parameters because the activity of phase I and II detoxification components tends to the level found in tumor-bearing rats, which were not exposed to pilot irradiation. Original Russian Text © M.M. Marchenko, G.P. Kopyl’chuk, O.V. 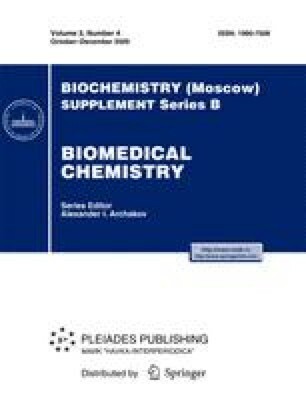 Ketsa, 2009, published in Biomeditsinskaya Khimiya.